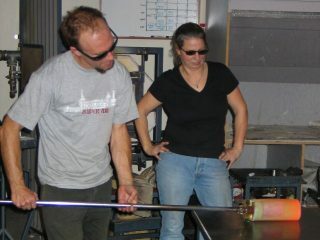 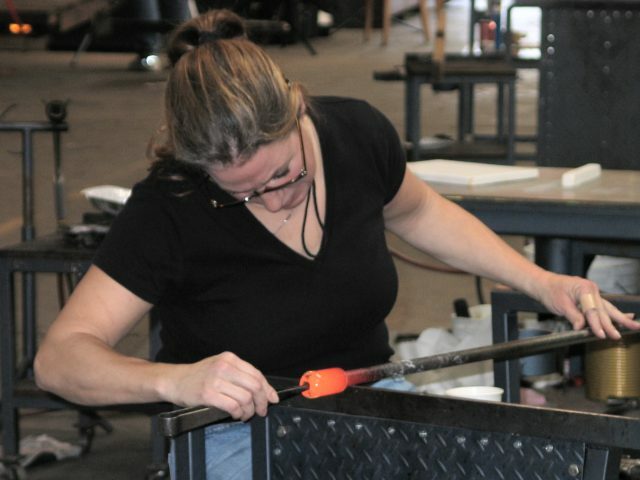 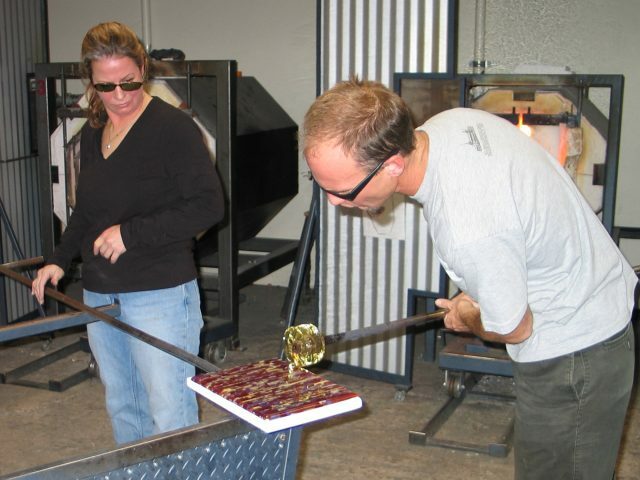 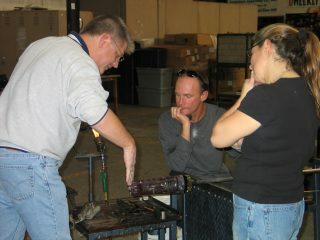 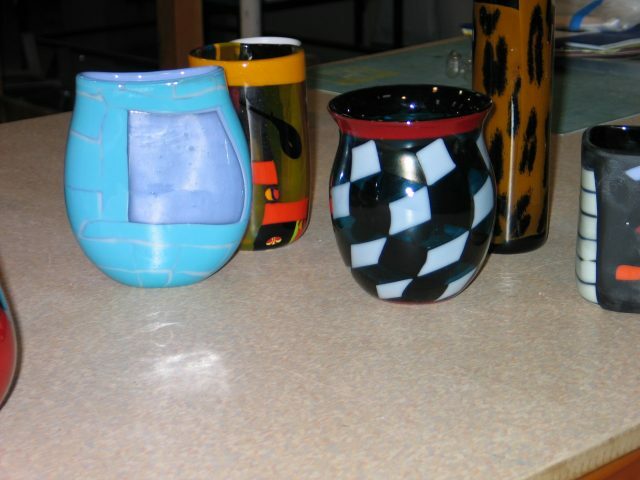 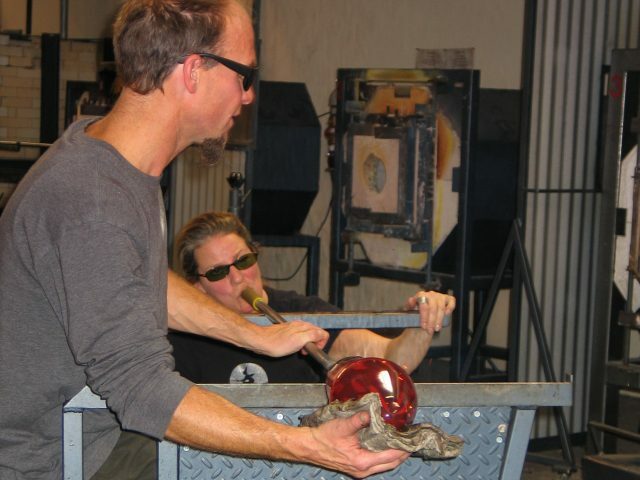 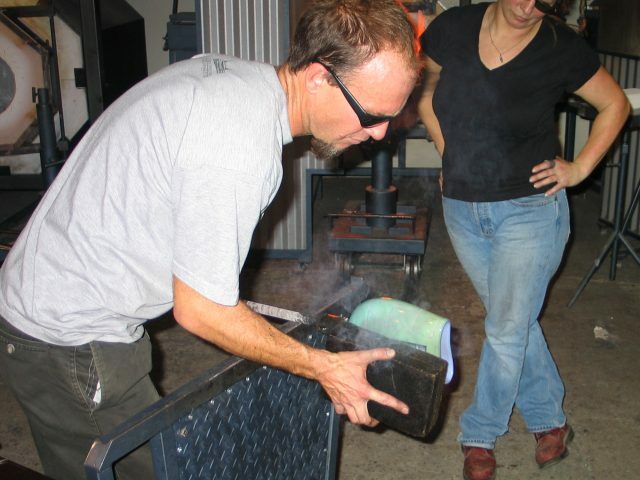 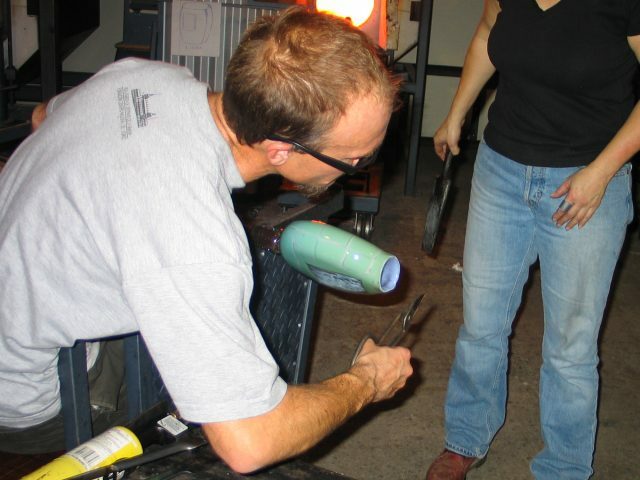 A rollups class was taught at the Eugene Glass School in November, 2004 by Avery Anderson and Johnathon Schmuck, and assisted by Sharon Gilbert. The photos below illustrate the process and display some of the pieces that were created. 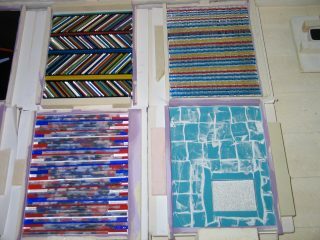 I have taken some liberties and intermixed photos from different pieces to more clearly illustrate the entire process. 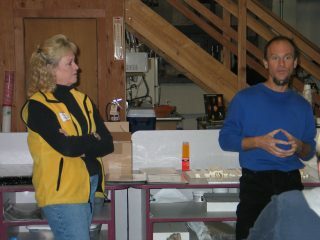 Avery Anderson and Johnathon Schmuck explain the design rules for rollups and describe the process. 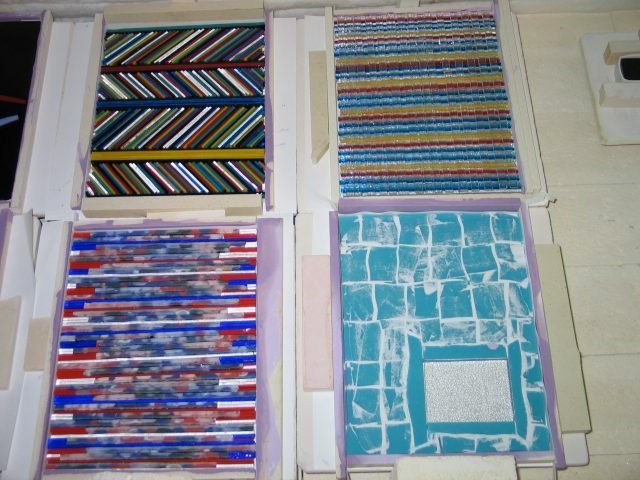 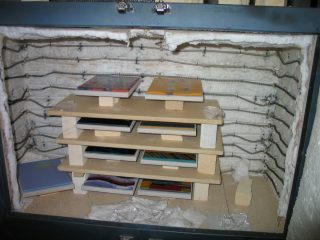 Tiles are placed in a kiln and full fused. After cold-working a bevel on the mating edges, all of the tiles were placed in the refrigerator annealer for preheating. 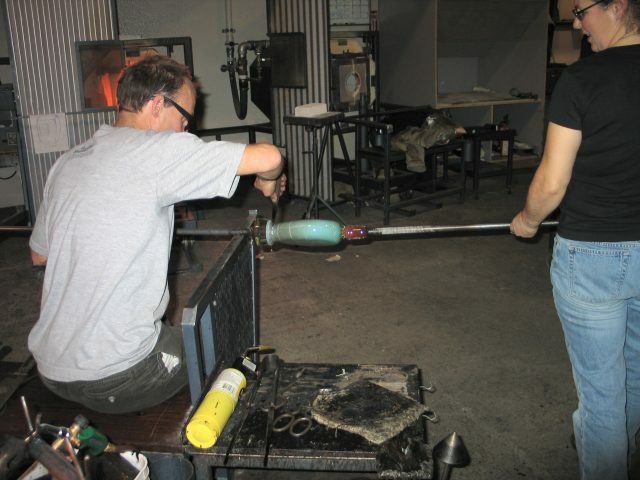 After gathering molten glass on the end of a blowpipe (hollow steel rod) Johnathon rolls the glass on the marver (smooth steel plate) to make it perfectly round. 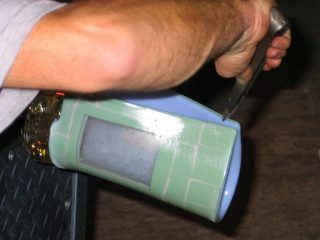 Johnathon measures the diameter with calipers to ensure that the circumference of the collar is equal to the length of the tile. 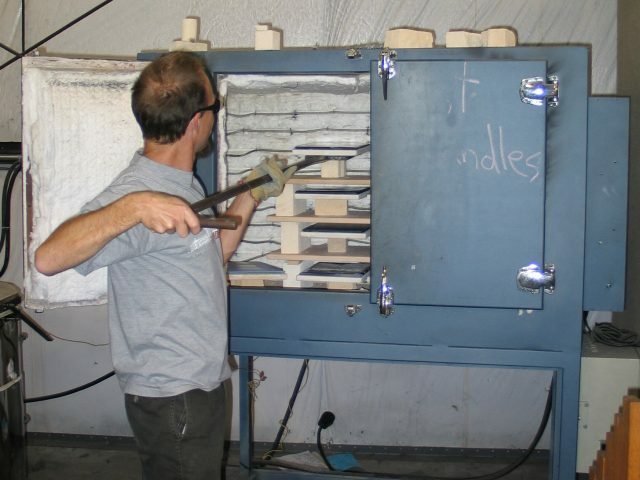 Johnathon removes a preheated tile from the refrigerator annealer with a pastorale fork. 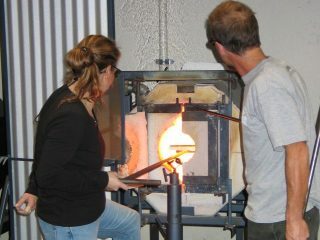 Sharon flash heats the preheated tile in the glory hole to soften the glass. 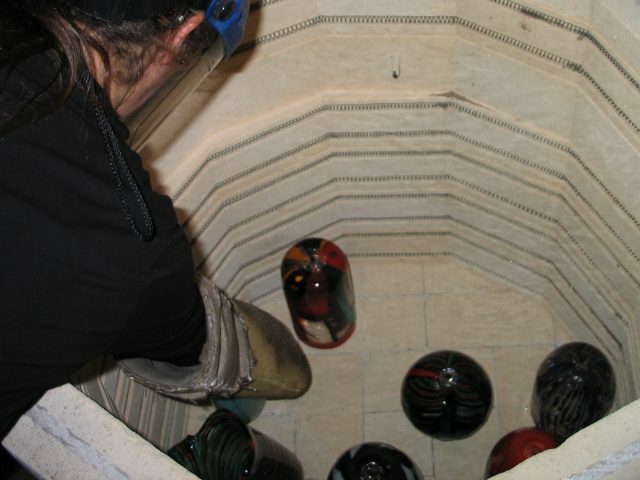 In this photo, Johnathon carefully aligns, then touches the collar to the edge of tile. 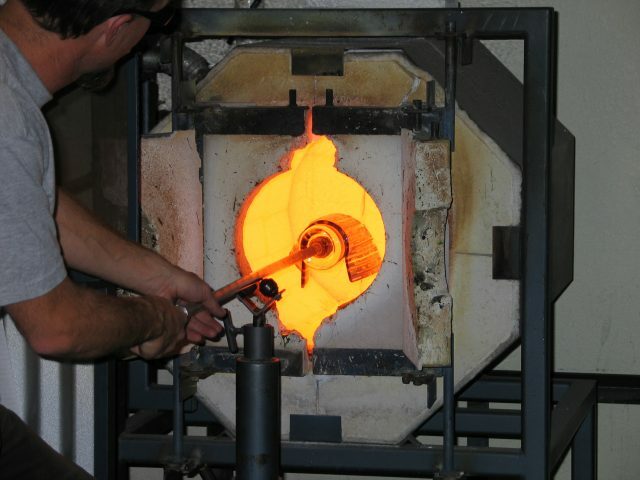 As Johnathon rolls the blowpipe, the tile sticks to the molten collar and lifts off the shelf. 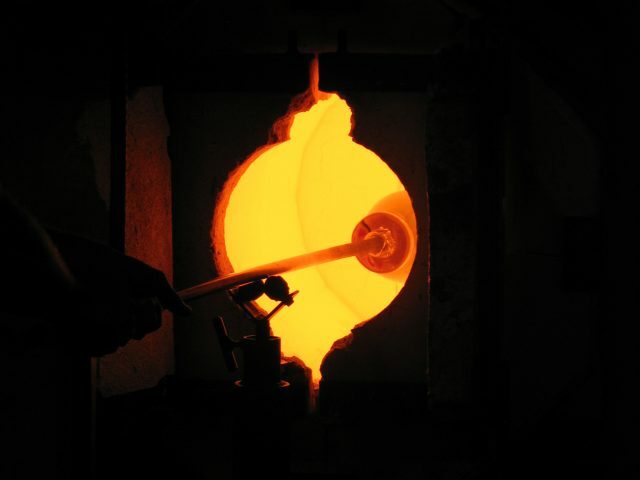 The tile and the blowpipe are then placed in the glory hole and heated so that the glass can be manipulated. 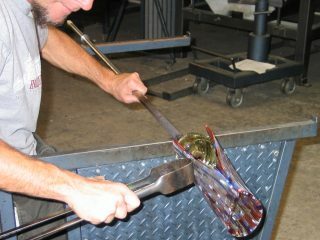 The corners are carefully aligned and slowly brought together to touch, then the piece is reheated. 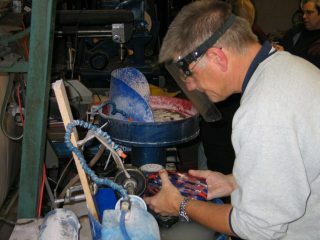 Johnathon uses the back of the jacks (big tweezers) to press the seam closed. 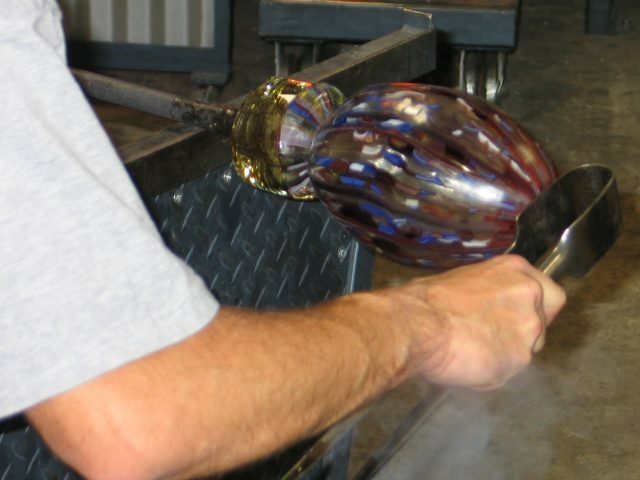 The process is repeated many times. 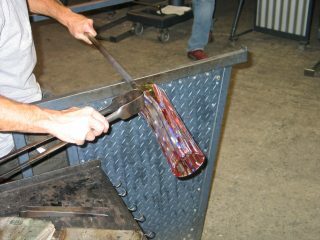 Eventually, the seam is closed. 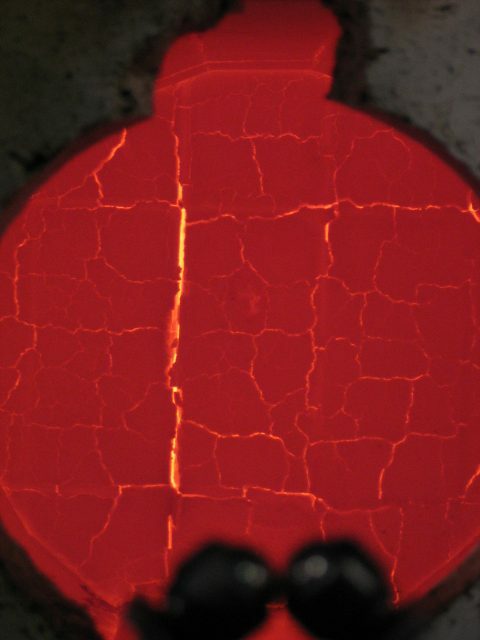 After closing the seam completely, the piece is thoroughly heated, then rolled on the marver to smooth the seam and round the vessel. 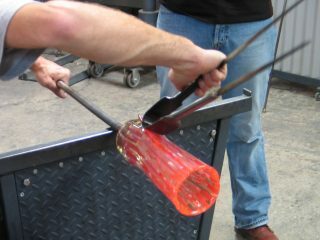 ...then cut with the diamond shears to seal the end. The piece of glass that is cut off is affectionately called a "frigger". 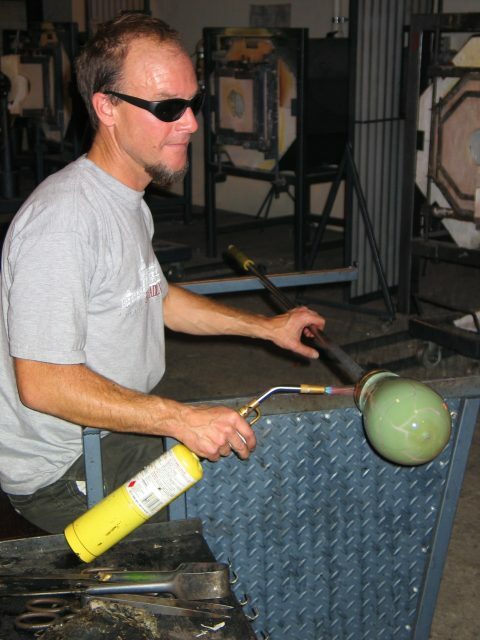 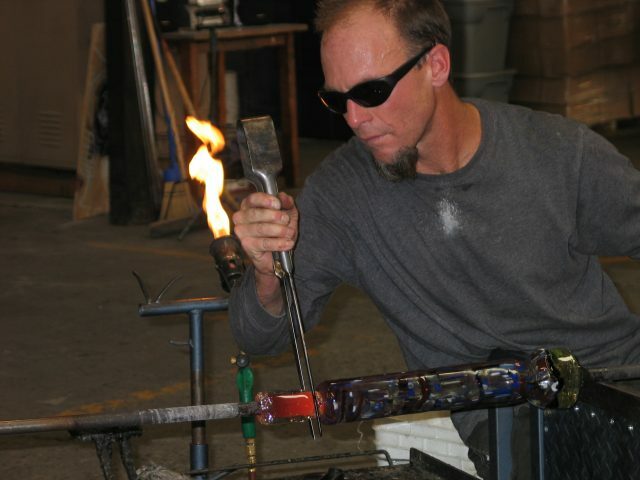 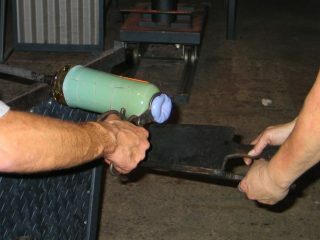 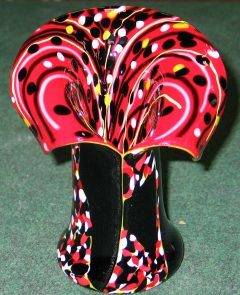 Now that the open end is closed, the piece can be worked using conventional glass blowing techniques. In this photo, Sharon is blowing while Johnathon shapes the piece with wet newspaper. 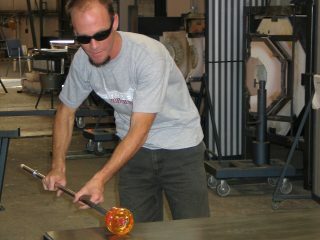 Johnathon used the jacks again to flatten the bottom of the piece. Johnathon heats the neck of the vessel with a small torch. The glass is kept pliable by heating and reheating the piece in the glory hole. 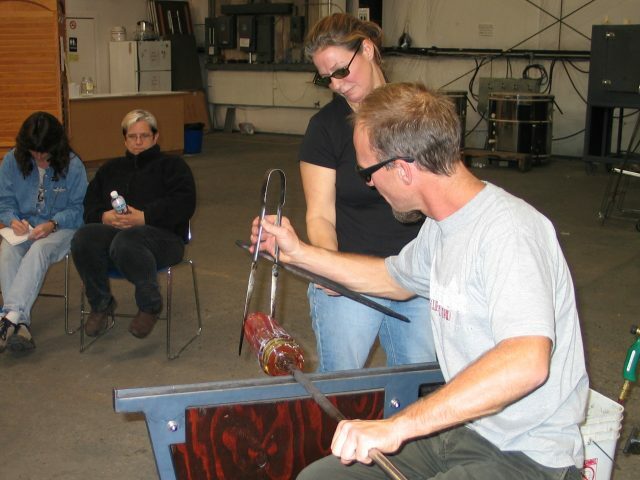 Sharon prepares the crown of molten glass on the punty (solid metal rod). 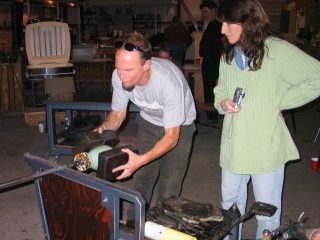 Sharon is holding the punty while Johnathon aligns it and presses it into the center of the vessel. 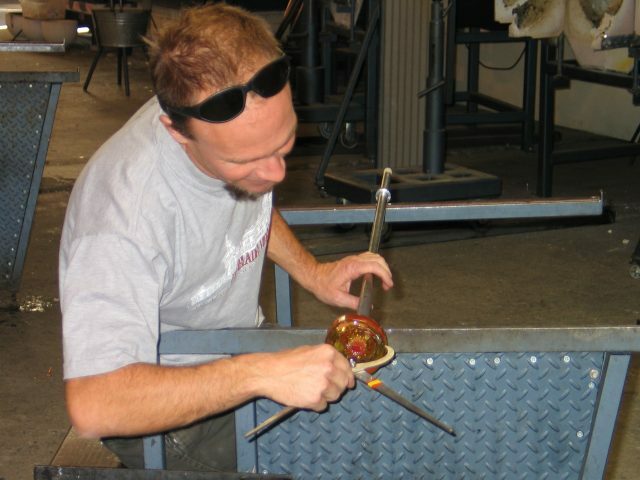 Johnathon is dribbling cold water on the neck of the vessel to crack it from the blowpipe and transfer the piece to the punty. 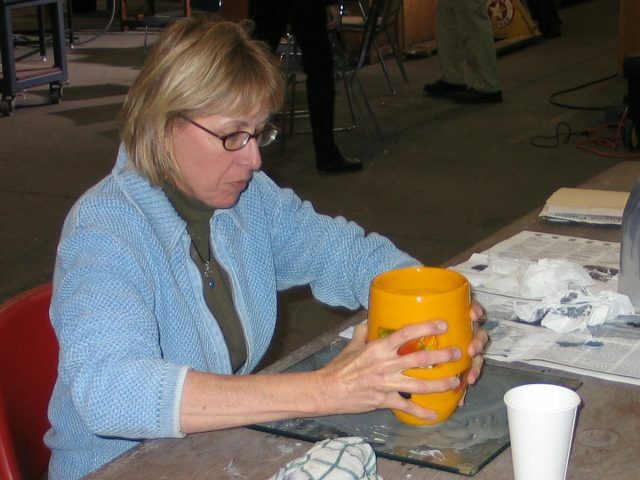 Notice the shape of Linda's vessel from the side. 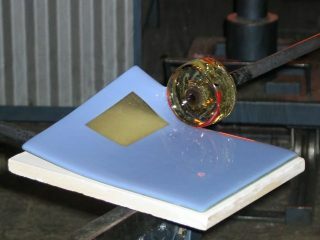 Two sides are very flat and the bottom has been flattened and dimpled slightly inward. After Sharon reheats the vessel, Johnathon begins to shape the open end of the vessel. 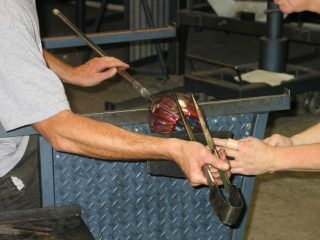 Here he trims the open end with shears. Johnathon shapes the open end of this vessel with his jacks as Sharon holds the wood paddle against the lip. Phil Hoppes describes the shape of his vessel's opening to Johnathon. Some final adjustments to the sides with the wet cork block and it's almost done. 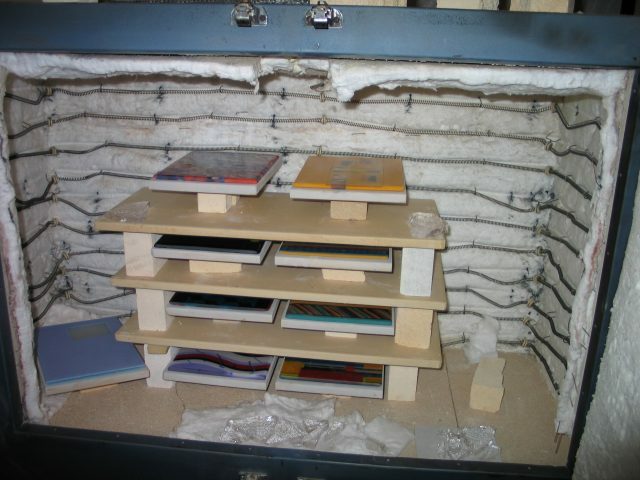 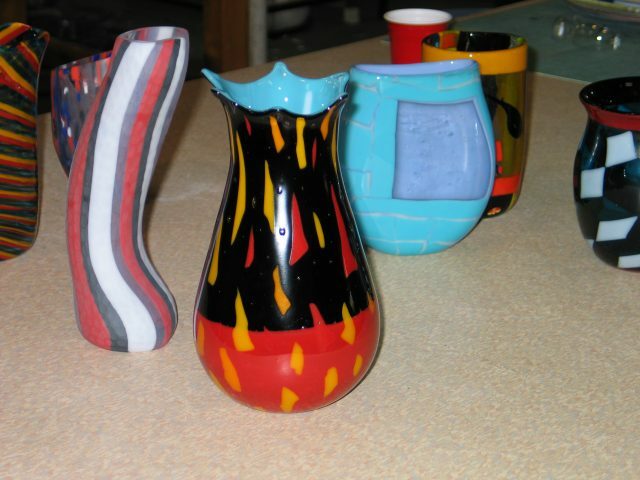 Placed in the annealing kiln with the other pieces, Linda's piece will be coldworked the next day. 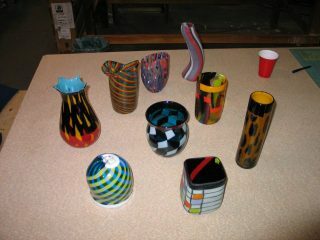 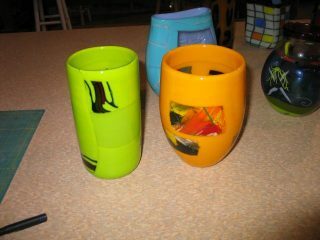 After coldworking, Linda's piece (on the left) stands straight with some of the other finished pieces. 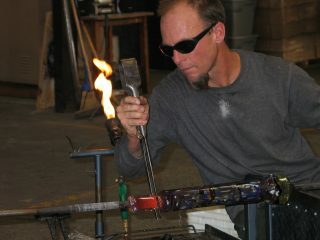 In this photo, Phil Hoppes is at the glass arbor grinding the remaining punty glass off the bottom of his vessel. The bottoms of the vessels are ground flat on a sheet of plate glass with a slurry of water and silicon carbide grit on it. Here, Claudia is concentrating on keeping the piece straight while making circles in the abrasive. 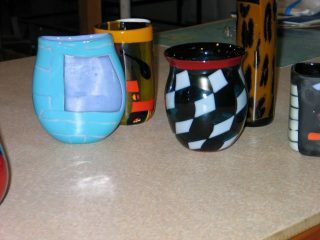 Some of the pieces from the first two days of blowing. Dorothy's second piece. 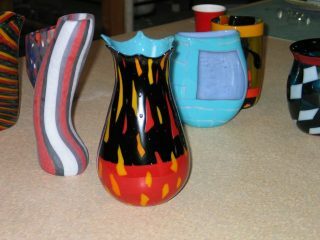 She went into the class with this design in mind.